The best part of doing your Christmas turkey on your barbecue isn’t just how it frees up the oven for hors d’oeuvres and side dishes, but the unique and flavourful taste that only a BBQ cooked meal can deliver. While the ease of cooking and clean up is one of the best things about cooking your Christmas turkey on the grill, the most obvious benefit is the taste. It’s simple to achieve a pleasing BBQ flavour and smoky sweetness just by adding smoking chips to a smoker tube or folded piece of aluminum foil. “By using a rotisserie for cooking the bird, you not only have the juices to make gravy or au jus, but it also browns the turkey evenly on the outside and keeps it moist and tender on the inside,” said Coulson. The average 15 lb. turkey will take about three hours, but cook accordingly. Stuffing: pulled bread, (sautéed onions and celery), sage, chopped bacon, peeled apples, trail mix (minus the chocolate) venison or Italian sausage. Turkey: Let the turkey stand in the fridge, thawed and uncovered overnight, the dryness of the fridge helps crisp up the skin while still sealing in moisture when grilling. Using a marinade injector, mix equal parts melted butter with your favourite beer and inject into the breasts and thighs of the bird. Season the bird with an equal mix of kosher salt, cracked pepper, thyme, sage and a touch of cinnamon. Put the stuffing in the turkey and seal the end with excess skin, push the rotisserie rod through the bird and secure with the meat forks. Tie the bird tight with butcher twine to keep the wings and legs from shifting and getting too close to the back burner. Place a tray or shallow roasting pan under the bird to catch the drippings. You can pour a bit of white wine and water into the pan to mix with the drippings. Preheat your grill with the bottom burners. When heated to 350 degrees, turn the bottom burners off and put the rear rotisserie burner on high for 10 minutes to seal the skin. Reduce the heat to medium for about 2 ½ to 3 hours depending on the size of the bird. Always use a thermometer to check for doneness in the thickest part of the thighs. The turkey’s thickest parts should be between 170-180 degrees Fahrenheit. 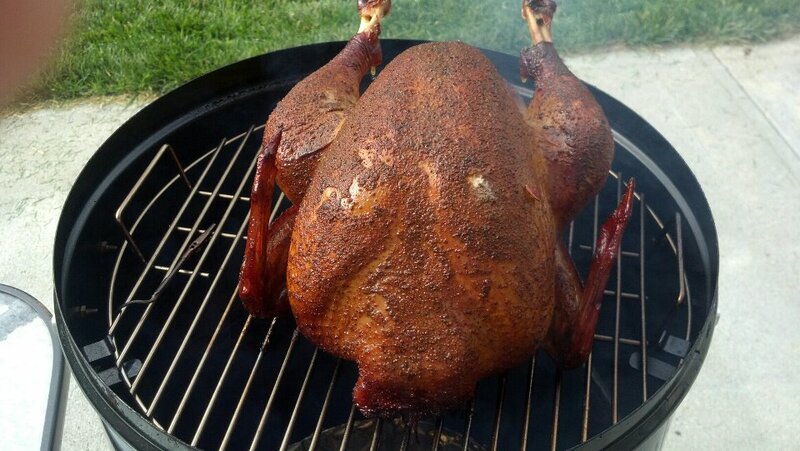 Why would you show a picture of a bird on a charcoal grill then give a recipe for how to grill a bird on a rotisserie? Neither is a poor option but the article doesn’t relate to the picture at all. It was the nicest looking picture I could find and to be honest you’re the first person to bring it up out of roughly 700 page views. Good point though.